[Upgrade Your Backyard] Available in 2 vibrant soft cushion colors with removable and machine washable covers, instantly upgrade your backyard into an oasis. [Durable & Easy to Clean] Expertly manufactured for durability with tightly weaved weather-resistant PE rattan and supported by quality tested rust-resistant steel frame, specialized handpicked materials for easy cleaning. [Compact & Space Saving] Saving valuable outdoor space, this set is perfect for backyards, patios, balconies, poolside and more. [Contemporary 4-Piece Set] Designed with a modern sleek curved build that seats up to 4 people comfortably with a sophisticated tempered glass coffee table with storage shelf. [Dimensions]Single Sofa: 20.9inchWX18.3inch (D) X31.9inch (H) Double Chair: 37inch (W) X 17.3inch (D) X 31.9inch Table:28.3inchWX 16.7inch (D) X 16.1inch (H). Description: Instantly enhance any outdoor space with the Merax Oasis Patio Set, an outdoor essential for any space. Complete with 4 pieces, this set comes with 2 single seat chairs and 1 double seat bench providing ample for you and loved ones, along with and a centerpiece coffee table accented with a tempered glass surface for a refined appearance. Tastefully store magazines, snacks or general décor on the table bottom shelf to make your time spent outdoors that much more enjoyable, or use the smooth removable tempered glass surface to help entertain guests with ease and display food, beverages, décor and more. Modern in design and conveniently compact, this set is crafted with handpicked materials formulated to be wear-resistant with a rust-resistant steel frame and weather-resistant tightly weaved PE rattan material. Enjoy this set in a variety of outdoor locations: in your backyard, patio, balcony area, poolside and more. Bring your outdoor space back to life with the Merax Oasis patio set and enjoy the great outdoors alone or with loved ones in your own backyard. 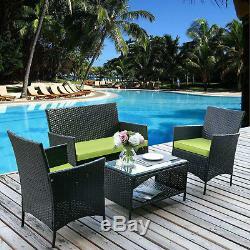 Removable Tempered Glass table top Tightly weaved wear-resistant PE Rattan material. High grade rust-resistant steel frame Sophisticated curved archway design with bottom storage shelf Table size: 28.3inchWX 16.7inch (D) X 16.1inch (H). Table weight capacity: 132 Lbs. Tightly weaved wear-resistant PE Rattan material. High grade rust-resistant steel frame Contemporary slightly curved overall design Chair size: 20.9inchWX18.3inch (D) X31.9inch (H). Sofa size: 37inch (W) X 17.3inch (D) X 31.9inch. Weight capacity for each chair286 Lbs. Removable and washable covers Soft foam interior Waterproof. The item "4 PCS Outdoor Patio Rattan Wicker Furniture Sets Cushioned Garden Table Sofa" is in sale since Wednesday, September 12, 2018. This item is in the category "Home & Garden\Yard, Garden & Outdoor Living\Patio & Garden Furniture\Patio & Garden Furniture Sets". The seller is "share_sweety_sunshine" and is located in Rowland Heights, California. This item can be shipped to United States.